Stanley Aronowitz is a professor at the City University of New York and Henry Giroux is a professor at the Pennsylvania State University. 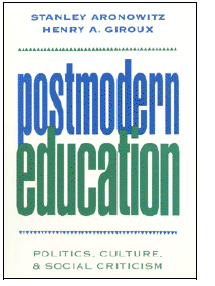 In 1991, they wrote a key book which introduced to education notions of ‘postmodernism’ had developed in the field of cultural studies. We live in a postmodern world that no longer has any firm boundaries … It is a time when reason is in crisis, and new political and ideological conditions exist for fashioning forms of struggle defined in a radically different conception of politics. For educators, this is as much a pedagogical issue as it is a political one.